Manufacturer of a wide range of products which include multi purpose grease, lubricating grease and heavy duty bearing grease. 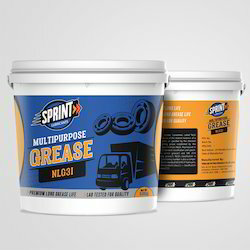 Our company is highly esteemed in offering Multi Purpose Grease to the clients. Grease is processed by our adroit professionals using optimum quality chemical compounds and advanced technology in synchronization with industry standards. Offered range is duly checked by quality experts against varied parameters in order to maintain quality. This product is lithium based high performance greases formulated with specific multi-functional additives and desired consistencies for lubrication under normal operating conditions and minimize wear and tear of machine parts. We offer a premium quality range of Lubricating Grease that have a high demand in numerous industries, including automotive. Characterized with high initial viscosity, these are semisolid lubricants, which drop to the same viscosity as the base oil to give the effect of an oil-lubricated bearing. Greases are used for infrequent lubrication, where lubricating oils fail to function effectively. The machine parts and bearing lubricated using these highly viscous oils have greater frictional characteristics. For valued patrons, we are indulged in providing Heavy Duty Bearing Grease to the clients. Heavy Duty Bearing Grease is renowned for attributes such as excellent lubrication and reduced friction. This product is checked by quality inspectors. We specialize in manufacturing and supply grease that is compatible for enhancing the performance of vehicle engines and machines. This product is specifically formulated from best quality of material. Offered range provides excellent lubrication under normal and adverse mechanical conditions.